Book directly through Capt. George at 561-324-3454 or book online by clicking the links above. 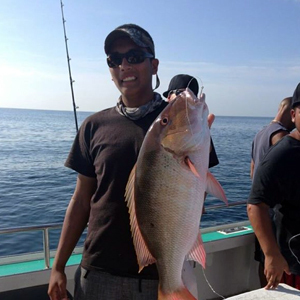 Drift fishing (also known as bottom fishing, reef fishing or deep sea fishing) is one of the popular charter options here at Mad Son Fishing Charters. Our crew will take you on a fishing adventure you will not soon forget. Captain George and his crew are highly experienced and will go the extra mile to make the experience enjoyable for both veteran fishermen and novices alike. The “Mad Son” launches from the Lake Park Marina and travels the area between the Lake Worth Pier and Jupiter Inlet. The crew is knowledgeable, providing you firsthand access to many excellent reefs and wrecks (ranging from 60 to 380 feet deep) along the way. When you book a drift fishing charter on the “Mad Son”, you will enjoy little-known fishing spots where you may come away with a prize catch. Some of the fish regularly caught on these trips include a variety of snapper, cobia, grouper, dolphin (mahi-mahi) and kingfish (also known as King Mackerel). However, in an area like the Palm Beach Inlet, the possibilities are nearly limitless. 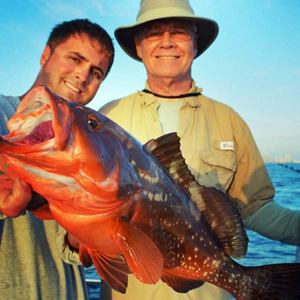 The drift fishing sessions at Mad Son Fishing Charters are four or eight hours long. These sessions are offered as a private charter for up to six or this trip is available to book for two or more smaller groups (up to six total) on the same voyage. “Mad Son” is the perfect size for up to six to comfortably fish. With fewer passengers, Captain George and his crew can give more attention to all the passengers and answer any fishing questions. This is especially beneficial for novices and children but provides an enjoyable experience for all who partake. Captain George and his crew look forward to taking you out for your day at sea! You are free to bring your equipment or use equipment provided by Mad Son Fishing Charters. Everything is provided, except snacks and drinks—bring your own if you desire. 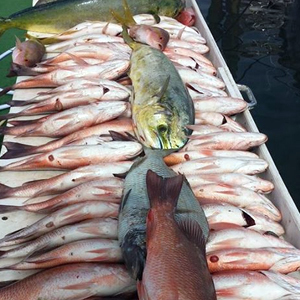 Call (561) 324-3454 to book your drift fishing charter today, or reach out to us if you have any questions. We look forward to hearing from you.